The lesson of today, another moment of an obvious wisdom – you never know what the travel is going to be about until is done. I remember when going by bus from Jerusalem to Eilat, I kept thinking that I really didn’t know what to expect in Jordan. I had a lot of prejudices and fears.. Especially after reading some information in the Internet about sexual harassment, roberies and cheating. I was kind of getting ready for the worst. What I have discovered once I found myself already in Jordan was a country with beautiful people. And maybe it’s again just my bubble. But even if it is, it means that I know how to surround myself with beautiful people, no matter where I am! Because I always meet beautiful people. 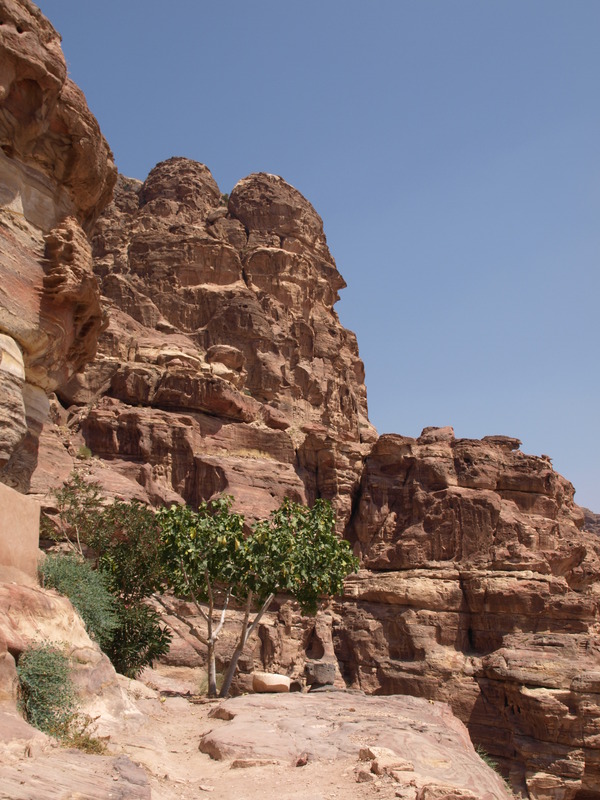 So today morning, still in Petra, I did the first this solo climbing to the Monastery. I was thinking of how much hiking and being in a nature teaches me about humility and how to deal with my own weaknesses. Once I climbed the mountain I saw all those beautiful views and I met Shadi on the top. First I thought that it’s another Bedouin and how much I don’t want to talk again and I just want to be left alone. But it was a really nice time we’ve spent together, not talking much and eventually walking down the hill together. There was so much peace in him. He told me that he lives in a cave up the hill and he climbs down once or twice a week. And I kept thinking how it is to sit up there all the time. And then Shadi invited me for a lunch. It was a moment when I felt really ashamed and didn’t know what to do. Becasue it was me who was a tourist in that place. Which is why, I thought, it should be me paying and buying and not the other way. So I refused, but he insisted, so I eventually decided to eat lunch with him. In such moments I remember again and again how good and beautiful people are. After lunch we hugged each other – Shadi went to the Bedouin village, I went my direction. All that has happened seemed kind of surrealistic. While I was waiting for a bus, a taxi driver showed up and offered to take me to the hostel. I didn’t have money to pay and the bus was for free so I thanked him and said that I’ll wait fir my bus. But it’s on his way, he said, and I don’t need to pay. So I jumped into a car and five minutes later I was back in the hostel. And spent another fifteen minutes just chatting with him in a car. Ahmad and Janin picked me up from the hostel and we drove together for three hours to Amman. Which was the three hours of doubts why I actually want to keep this bike ride becasue I still actually don’t know that. That was for the first time I admitted to myself that I started having doubts and that I don’t really feel like doing this. And I started to be afraid of this idea.. The result of those three hours of thinking was that I want to do it because I want to keep a record of other travellers stories. But I still keep asking myself – is this a real reason? In Amman I met Lucas. And from the very first minute we kept talking and talking, mainly about why we do actually travel. And that acually while we start travelling, we don’t really know the reason why. And we know the reason only when the journey is over. It is usually very difficult to explain it to someone who doesn’t have a Wanderlust. It’s like something you just simply want and you cannot really say why you want it. You just do. Yes, that’s what I feel like right now. Aha, and Paula says that people keep talking about me. Well, it kind of feels good because I feel like everybody already forgot about me. So somehow I’d like people to miss me. That would mean that I matter for them somehow, right? It was a loooong and goood day. I had to wait for it for quite a while but I’m so happy it eventually happened. Wow, my own birthday will be in two weeks already! A desert is a place where only the magic things are happening. And it turns out that the Jordanian desert is the next desert visited and the next one that seems to be my own little heaven on Earth. I arrived to Wadi Rum to a little Bedouin camp (six double tents, two dorm tents, toilets, shower!) owned by Ahmad. This camp is not a regular camp – despite the fact that everything is so minimalistic and simple in here, it is very practical and comfortable as well. Everything has a place and is here for a reason. And the time passes so slowly in here.. Those moments I’ve spent lying down and stargazing – these are the ones I will remember for a looong time. At the same time I’m planning my last week in the Middle East. Still ahead of me – today the desert (Wadi Rum), tomorrow and the day after tomorrow – Petra, then Amman and three last days in israel. And next Sunday I’ll be back to Poland. It still feels so unreal!